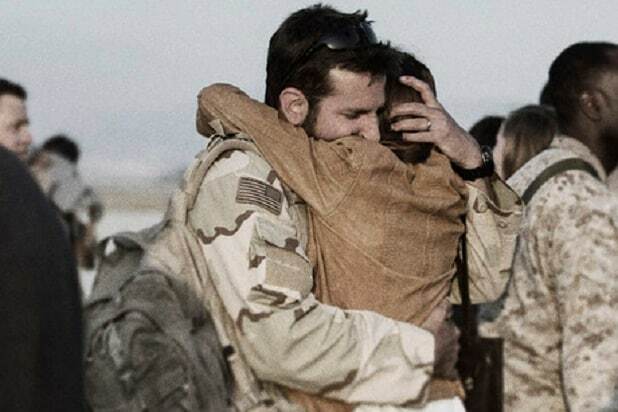 “American Sniper” was not named Best Picture of the Year at the Oscars this year, but it is the best picture of 2014 at the domestic box office. Clint Eastwood‘s Iraq War drama starring Bradley Cooper as real-life sniper Chris Kyle has beaten out “Hunger Games: Mockingjay — Part 1” to become the highest-grossing domestica release of 2014. Latest box office figures put “American Sniper” at $337.2 million, while Jennifer Lawrence‘s third adventure as young adult heroin Katniss Everdeen grossed a total of $336.9 million at home. Internationally, however, “Hunger Games” is the victor with $751.9 million, in total. “American Sniper” just passed the $500 million mark worldwide, thanks to $163 million from foreign territories. “American Sniper,” which won an Oscar for Best Sound Editing last month, has already surpassed “Saving Private Ryan” as the top domestic grossing war movie of all time. Tom Hanks starred as the coach of a woman's pro team with Madonna, Rosie O'Donnell and Geena Davis in 1992's "A League of Their Own," which made $107 million at the box office. Brad Pitt starred as forward-thinking Oakland A's general manager Billy Beane in 2011's "Moneyball." Jonah Hill co-starred in the film, which made $75.6 million. It made $34 million overseas, best-ever for a baseball movie. Dennis Quaid plays a high-school coach who gets his shot at the majors in "The Rookie," which brought in $75.6 million in 2002. Kevin Costner built it -- a baseball diamond in an Iowa cornfield -- and they came in 1989's "Field of Dreams." Fans came to the multiplexes to the tune of $64.4 million. Rob Schneider, David Spade and Jon Heder battled bullies -- and little leaguers -- in the 2006 comedy "The Benchwarmers." It posted the best opening weekend of any baseball movie at $19.6 million and went to take in $59.8 million. When an accident miraculously gives a boy (Thomas Ian Nicholas) an incredibly powerful arm, he becomes a major league pitcher for the Chicago Cubs in 1993's "Rookie of the Year." It made $53.6 million. Tim Robbins played a pitcher on the way up and Kevin Costner was a catcher on the way down in Ron Shelton's 1988 minor league tale "Bull Durham." Susan Sarandon played a groupie who was muse to both. It took in $50.8 million at the box office. A very young Joseph Gordon-Levitt and Danny Glover starred in 1994's "Angels in the Outfield," which made $50.2 million. Charlie Sheen played Ricky "Wild Thing" Vaughn in "Major League," which took in $49.7 million in 1989 and spawned a sequel. Robert Redford played a slugger with a very mysterious past in 1984's "The Natural," which brought in $47.9 million. Drew Barrymore falls for a big-time Boston Red Sox fan played by Jimmy Fallon in "Fever Pitch," which scored $42 million in 2005. Keanu Reeves agrees to coach a Little League team from the housing projects in Chicago as a condition of getting a loan from a friend in "Hard Ball," which rolled up $40.2 million in 2001. Clint Eastwood played an aging scout, joined on the road by his daughter (Amy Adams) in 2012's "Trouble With the Curve," which grossed $35.7 milion. Sam Raimi directed Kevin Costner and Kelly Preston in 1999's "For Love of the Game," which brought in $35.1 million at the box office. Walter Matthau played the beer-swilling manager of a very bad little league team that featured a foul-mouthed Tatum O'Neal in 1976's "The Bad News Bears." It brought in $32 million at the box office, just a little less than a 2005 remake starring Billy Bob Thornton managed.